A trial has begun of a vaccine to treat an aggressive form of brain cancer. The first patient in Europe has received the treatment at King’s College Hospital in London. Robert Demeger, 62, was diagnosed with the condition earlier this year. The personalised vaccine is designed to teach his body’s immune system to fight the tumour cells. King’s is one of more than 50 hospitals – the rest are in the US – which are testing the treatment. 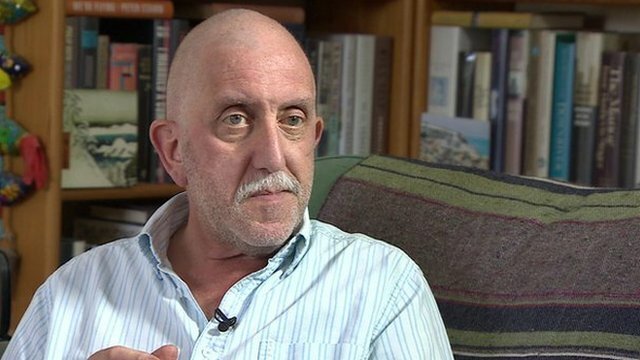 Mr Demeger, a stage and TV actor, had to give up his role in the acclaimed National Theatre production of Othello when he began having seizures. “I had an understudy and I said, if I get ill on stage just take over the line, but fortunately it never happened. Before his operation he was offered the chance to be the first patient in Europe to join the international trial. Surgeons removed as much of his tumour as possible. It was incubated in a lab alongside dendritic cells – specialist immune cells taken from his blood. The aim was to teach the cells to recognise the tumour. The resulting personalised vaccine was injected in his arm, with the hope that the cells will train others in the immune system to seek out and destroy the cancer. He will receive 10 doses of the vaccine over the coming two years. Keyoumars Ashkan, a neurosurgeon at King’s, is leading the UK arm of the trial. He says there is a pressing need for new and better treatments for brain cancers. “Even if a tumour seems the same between two patients, the reality is they are very varied. The trial involves patients with glioblastoma, the most aggressive form of primary brain tumour, which affects around 1,500 people in Britain every year. Average survival time is just 12-18 months. Two previous small studies of the DCVax therapy, in the US, found that it extended that to three years, without toxic side-effects. Twenty patients were involved and two of these have so far lived for 10 years. Mr Ashkan stressed that the current trial, which will involve 300 patients, is needed to show whether the treatment is truly effective. Half will receive the personalised vaccine and the rest dummy injections. “Until we get the results of this research, we will not know whether the therapy should be offered to all patients” he said. Mr Demeger says he is delighted to be part of the research. “Anything that may give me a better chance, but also others, is worth taking part in” he said. The surgery to remove his cancer affected his speech, because the tumour was sitting close to the part of the brain dealing with language. So Mr Demeger, whose voice has been his livelihood, has had to re-learn how to communicate. “I’d love to get back to acting. It’s my job. “I’ve been working with a speech therapist and the head of voice at the National. This entry was posted in HEALTH and tagged Actor, Brain tumor, Demeger, Immune system, King's College Hospital, London, Tumor, Vaccine.